In recent years, a growing number of studies have examined the role of narratives in marketing, with the majority focussing on the use of narration in advertising. Today’s consumers are engaging with enormous amount of narratives in form of online reviews. Consumers use stories to give meaning to their product experiences and make decisions (Nielsen and Escalas 2010). They read and process stories shared by other consumers to shape their own judgements. Nevertheless, our understanding of how different individuals process narratives and the mechanism that underlies their diverse behaviour is very limited. This research aims to examine how different segments of consumers evaluate online reviews that are written in a narrative form. 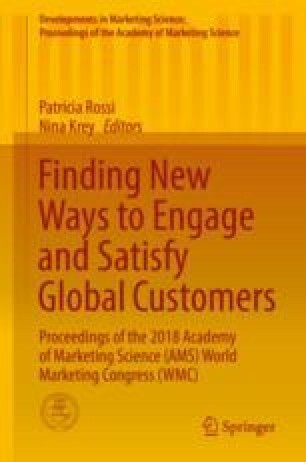 Drawing on marketing and decision science literature, it suggests that consumers’ decision-making style (e.g. maximizers and satisficers) explains their information usage behaviour and evaluation strategies (Schwartz et al. 2000; Karimi et al. 2015). It can therefore influence the way narratives are processed. In order to test the relationship between consumers’ decision-making style, evaluation strategy and narrative processing behaviour, video recording techniques were used. Ninety-five participants were recruited and exposed to a number of reviews in a laboratory environment. As they were interacting with online product reviews, their information processing behaviour and verbal protocols were recorded. Findings revealed that decision-making style of consumers has a significant effect on their information processing behaviour. The relation between the decision-making style and information processing behaviour is mediated by the evaluation strategy they adopt. That is, satisficers are more prone to adopting a holistic approach to product evaluation which leads to analytical information processing, whereas maximizers tend to focus on detailed evaluation of product attributes that can prompt narrative processing behaviour.